This article is about theoretical Germanic protolanguage. For the Germanic tribes described by Pliny and Tacitus, see Irminones. Elbe Germanic, also called Irminonic, is a term introduced by the German linguist Friedrich Maurer (1898–1984) in his book, Nordgermanen und Alemanen, to describe the unattested proto-language, or dialectal grouping, ancestral to the later Alemannic, Lombardic, Thuringian and Bavarian dialects. During Late Antiquity and the Middle Ages, its supposed descendants had a profound influence on the neighboring West Central German dialects and, later, in the form of Standard German, on the German language as a whole. The term Irminonic is derived from the Irminones, a culturo-linguistic grouping of Germanic tribes, mentioned by Tacitus in his Germania. Pliny the Elder further specified its meaning by claiming that the Irminones lived "in the interior", meaning not close the Rhine or North Sea. As such Maurer used it to refer to the dialects spoken by the Suevi, Bavarii, Alemanni and Lombards around the Hercynian Forest and northeastern German plain. Mauer asserted that the cladistic tree model, ubiquitously used in 19th and early 20th century linguistics, was too inaccurate to describe the relation between the modern Germanic languages, especially those belonging to its Western branch. Rather than depicting Old English, Old Dutch, Old Saxon, Old Frisian and Old High German to have simply 'branched off' of a single common 'Proto-West Germanic', which many previous linguists equated to "Old German / Urdeutsch", he assumed there to have been much more distance between certain dialectal groupings and proto-languages. 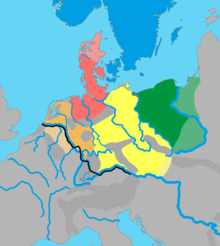 Elbe Germanic is considered to be the predecessor of all the Upper German dialects, Alemannic, Bavarian and Langobardic. ^ Friedrich Maurer (1942) Nordgermanen und Alemannen: Studien zur germanische und frühdeutschen Sprachgeschichte, Stammes- und Volkskunde, Strasbourg: Hünenburg. ^ Johannes Hoops, Heinrich Beck, Dieter Geuenich, Heiko Steuer: Reallexikon der germanischen Altertumskunde: Band 7; Walter de Gruyter, 1989, ISBN 9783110114454 (pp 113–114). ^ R.D. Fulk (15 September 2018). A Comparative Grammar of the Early Germanic Languages. John Benjamins Publishing Company. pp. 17–. ISBN 978-90-272-6313-1. Grimm, Jacob (1835). Deutsche Mythologie (German Mythology); From English released version Grimm's Teutonic Mythology (1888); Available online by Northvegr © 2004–2007:Chapter 15, page 2-; 3. File retrieved 11-18-2015. Friedrich Maurer (1942) Nordgermanen und Alemannen: Studien zur germanische und frühdeutschen Sprachgeschichte, Stammes- und Volkskunde, Strasbourg: Hünenburg. James, Edward (1988). The Franks. The Peoples of Europe. Oxford, UK; Cambridge, Massachusetts: Basil Blackwell. ISBN 0-631-17936-4. Gregory of Tours (1997) . Halsall, Paul, ed. History of the Franks: Books I–X (Extended Selections). Medieval Sourcebook. Translated by Ernst Brehaut. Columbia University Press; Fordham University.